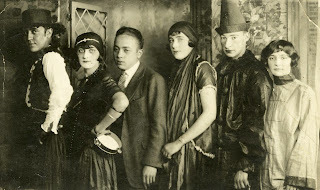 Alice (fourth from left), in show as a young woman, and below with brother Ben, about 1952. The year 1907 sounds so distant. But it grew even more so today as we buried my Aunt Alice, who died this week at the age of 106-plus. Alice Ettlin Krupsaw was born on Feb. 28, 1907. Her parents Louis and Ida Ettlin were Jewish immigrants from the Russian Ukraine who largely achieved the American dream, although they never became American citizens. Ida, my grandmother, mostly spoke and only read in Yiddish. Louis Ettlin was a tailor, working in department stores and for a time his own Baltimore shop at the southeast corner of Calvert Street and North Avenue. Several relatives from the old country also had tailoring businesses around the city. In a memoir included in a book of her poems, paintings and family photographs, published for Alice's centennial birthday, she recalled early childhood years on Eagle Street, "Little Israel," in the city's southwestern corner and on Monroe Street a few miles to the north -- a house more modern, since it had electricity. "And what a great time my brother Ben and I had running into every room, pushing buttons just to see the lights go on," she wrote. A house with electricity, papa's "Tin Lizzy" car with a crank-operated starter, an ice box refrigerator that needed a 10-cent block of ice to keep stuff cold. It was another world back then. Yet she lived to see man set foot on the moon, and marveled as recently as three weeks ago at how a great-nephew could take her picture with his SmartPhone and immediately show her the image on its screen display. She marveled at videos of herself singing that appeared as if by magic on my laptop computer, and was delighted -- even if she could not fathom how it was possible -- that thousands of people across the planet had also seen her, on YouTube. 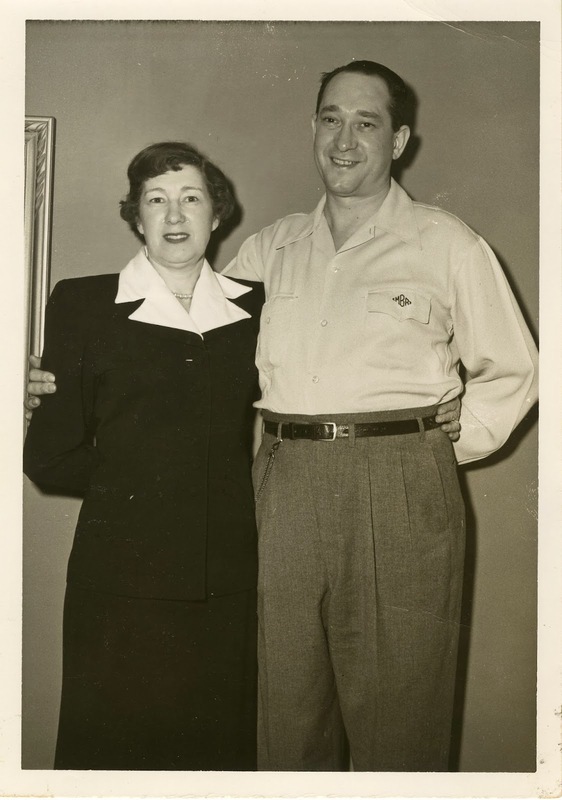 Alice attended high school and Strayer's secretarial school, and was about 22 when she married Louis Krupsaw, a cook and former Marine who later was to serve in the U.S. Army. They operated a delicatessen for a short time in Baltimore, but no one can remember when or exactly where. I heard once that it was on Gay Street. The only evidence is the rudimentary start of a novel Alice tried to write in pencil -- on brown butcher paper. Judging by the dates on photos, Alice and Lou moved to Washington about 1950. He became a route delivery man for the old Washington Daily News, and Alice began a series of jobs with federal government agencies -- the mint, the printing office and Walter Reed Army Hospital. She enjoyed telling about the time she delivered a set of President Dwight Eisenhower's X-rays to a White House official, and of meeting First Lady Mamie Eisenhower. Lou died in 1955, and was buried in Arlington National Cemetery. He was just 56 years old, and they'd had no children. He left her with memories of their numerous trips, to Florida, out west, and to Havana, Cuba. Pictures, most of them faded from the passage of years, show her in the various locales, including riding horseback with Lou. And there's souvenir photos from fancy restaurants, like Club Cairo in Northwest Washington, where they celebrated a few of her birthdays in the late 1940s. In 1977, she took painting classes at the Waxter Senior Center in downtown Baltimore, and began turning out works on canvas that one might classify as primitive art -- my favorite was a painting depicting two young children pulling a sled down a snowy country lane toward a farmhouse. They were some of the children she never had. Alice made most of her own clothes. Her baby brother Sam, now 94, recalls asking if she could make covers for his golf clubs. She knitted them -- sort of like sock puppets, each with a whimsical head. Then she thought about making smaller ones, as finger puppets about 3 to 4 inches long, perfect for children to play with. And in the ensuing years she made countless hundreds of them, each taking about an hour and a half to create. She donated them to hospitals, schools and children's homes around the country and in Israel -- and more golf club covers for charity sales. "Dear Alice," he wrote. "Thank you for the finger puppet. I might make a puppet show. I named it Freddy. It is a he. I have a gerbil named Freddy. My cat knocked it over." She filled her apartment with dolls, human and otherwise, and dressed them in clothes she made. They were also her children, and she created an elaborate Jewish wedding scene for some of them. Alice wrote scores of poems. She wrote them by hand, and then typed them, over and over, for more than 30 years. Some of them are pretty good -- so good, I worried she copied them from somewhere. Google searches never turned up a trace, however. She had two reference books tucked in a worn-out satchel of her writing -- an old dictionary, in which Alice had written words with their definitions and synonyms inside the front and back covers, and a Gideon bible with a stamp suggesting she obtained it in some manner from the Walter Reed hospital. I joked with the cantor preparing for Alice's funeral that I was sure she read only the Old Testament part. Ten years ago, Alice lost a leg to a blood clot. She had to move permanently into a nursing home, Milford Manor -- abruptly giving up her apartment and the battered car that appeared from its many dings she had parked mostly by Braille. 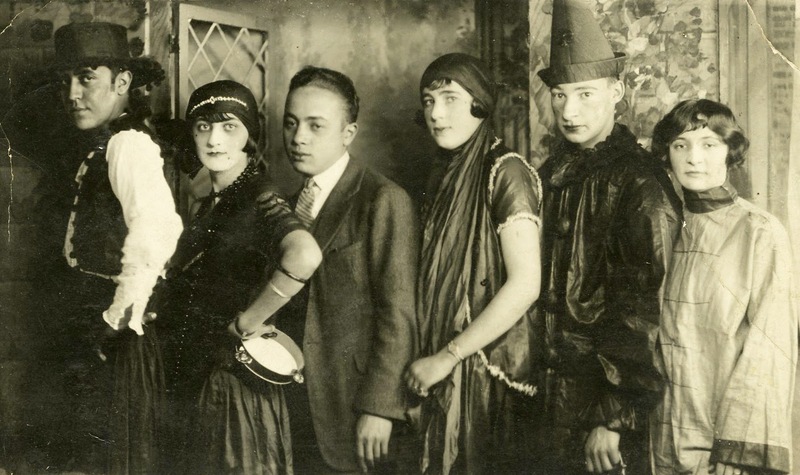 For years, Alice had performed as a singer and dancer -- there's a picture of her, above, in a troupe of entertainers for some program lost in the mists of time. But in her later decades, she appeared with seniors entertainment troupes that played mostly to audiences in senior centers and nursing homes. 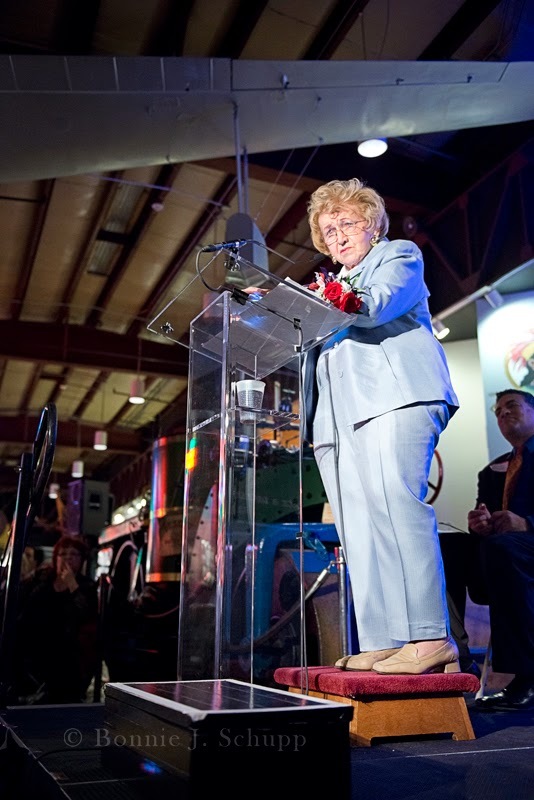 She'd often say she never imagined herself as being part of the audience, in a wheelchair. Ten years in a nursing home is, frankly, unimaginable. She found herself surrounded by aging, helpless people who mostly were unable to communicate or deep into dementia, but gradually she adapted and tried to make the most of her situation. Her poetry began appearing in monthly editions of the Milford Manor news bulletin. 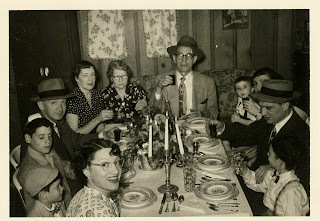 She enjoyed bingo, and slipping the nickels and dimes she won to her great-great-nephew Jadon Axe for his college fund. She won a lot of nickels and dimes, but not that many! Alice had a mantra that she would chant to visitors and nursing home aides, about how they should make every effort to fulfill their dreams, while they had healthy minds and bodies. "Do it now," she would implore them. "Do it now." She would on occasion sing, as best she could, her favorite song: "Enjoy Yourself (It's Later than You Think)" -- and on her 101st birthday, my wife Bonnie Schupp got that on video. She put it on YouTube, and the number of viewers slowly grew. It was at nearly 2,000 when CNN broadcast journalist Josh Levs included an excerpt in his Saturday afternoon feature on viral videos. Alice on many occasions would marvel at having lived so long. One of her regular visitors was my brother Larry, who died in 2009 at the age of 70. "Poor Larry," she would say, and had a hard time understanding the whys of death for those much younger than herself. "Who wants to live like this?" she'd say as the years of dependence in the nursing home mounted. "But what's the alternative? I don't want to die." On good days, Alice would wish to live another 50 years so she could witness the technological marvels to come. On bad days, she had trouble remembering names. She was convinced someone stole her battered old hearing aid. It was an obsession. She had friends among the employees and volunteers who did their best to make life at Milford Manor bearable, and one close friend among the residents at the other end of a long hall, Ethel Vanger. At a surprise party for Alice's 104th birthday -- she had to be cajoled out of her room after a small family gathering -- Ethel read a touching testimonial speech she had written for the occasion. How quickly life turns. At Alice's 105th birthday, Ethel was wheeled into the room but stayed for just a few minutes. She wanted to be at the bingo game. She seemed confused. Just days later, Ethel died. Alice's baby brother flew to Baltimore from Florida yesterday. The only surviving sibling -- their brother Ben Ettlin, my father, having died in 1989 -- Sam has lost others he loved over the years, including a daughter and two wives to cancer. He told me a year ago his reason for living was now to be there for Alice, to bury her before he goes. But since then, he moved from a condo to a seniors apartment community near Fort Lauderdale, and has a new girlfriend, so to speak. He's thinking of giving up his car, but apparently not giving up on life. Accompanying Sam were his son Dennis, a lawyer in the Maryland suburbs of Washington, and daughter-in-law Patty; and there were nephew Larry's widow Natalie, who has been Alice's most frequent visitor for a decade, and son Greg, the only one of her three children living in Maryland; Bonnie and me; and three young women who were among the caring people on the staff at Milford Manor. And there was Cantor Thom King of Beth El Congregation, who did not know Alice -- save for our stories about her, and Bonnie's YouTube videos -- to officiate and sing the prayers. There were the funeral home director, and several workers who had prepared the grave in a soggy, low-lying section of the cemetery between brother Ben and his wife Rose, and parents Louis and Ida. The lots had all been purchased decades ago, for $5 each. Three of Rose's brothers are there, and elsewhere on the site are other family members, including Rose's mother Jennie Kaplan, who died of influenza in 1919. There's also Jennie's husband David Kaplan, who died on Jan. 16, 1945, a year to the day before I was born and given his name. Chairs covered with green cloth were set up on the narrow asphalt lane that rises through the midline of the cemetery. Bright sunshine eased the chill of morning temperatures warming toward the 40s. The narrow walkways and grass still wet from snowmelt and rain made the open lane the safest spot for Alice's brief service. Cantor King pinned a black ribbon on Sam's jacket, then cut off a piece of the ribbon -- symbolic of the centuries-old ritual of mourners rending their clothing in despair. Alice's brother, he explained, was the only mourner obligated to observe the custom of prayers for the dead that will continue for him back in Florida. After the service and a sharing of remembrances of Alice by several of us, the funeral director and cemetery workers began wheeling her wooden casket -- plain save for its raised Star of David -- down the path. I stepped over and placed my hand atop it, joined by my cousin Dennis, and we walked with it as pallbearers. As we stood by the stark grave, next to the excavated mound of wet earth and clay that enveloped the resting place of Ben and Rose, the workers lowered the casket. Sam and the others walked down the path and lined up behind us. First the cantor, then each of us, took shovel in hand to drop in the first bits of earth. It is the last gift for the dead, and today for one who filled her life with meaning as best she could. 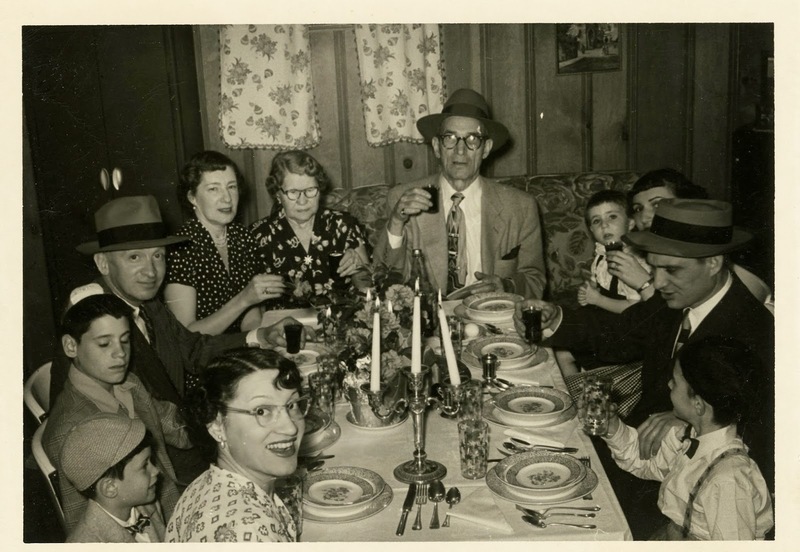 The family seder, 1951, in a photo taken by Ben Ettlin, shows (clockwise, from bottom) Rose, their sons David and Larry Ettlin, Lou and Alice Krupsaw, Ida and Louis Ettlin, Sam's late daughter Cindy and first wife Miriam, and Sam and Dennis Ettlin.